Among the Sound’s rich wildlife, none is more famous or more essential than its wild salmon. All five species of Pacific salmon inhabit the waters of the Copper River and Prince William Sound, driving traditional Native culture as well as the economies of the region. 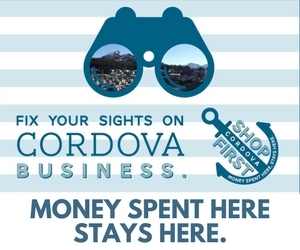 Cordova is a working fishing town and proud home of the world’s finest wild salmon! The whole place seems to move with the rhythms of the fish. In early spring, the community shakes off the winter doldrums and the population booms as the fishing season begins. Independent fisherman work tirelessly along the cold and often rough waters of the Copper River and Prince William Sound to bring these heart-healthy and sustainably harvested fish to market. Renowned for their unparalleled flavor, color and quality, Copper River sockeye and chinook salmon are treasured by connoisseurs throughout the world. In summer, purse seiners ply the Sound in search of pink and keta salmon. The fleet harvests coho salmon in August and September. Visit copperriversalmon.org for more information on this wildly delicious Alaskan salmon, sustainably hand harvested with care from pristine waters by independent artisans.